The Chipper Clipper: Free Auntie Anne's Pretzel TODAY Saturday February 20th! Free Auntie Anne's Pretzel TODAY Saturday February 20th! 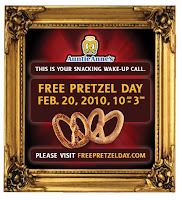 Mark you calendars for a Auntie Anne’s Free Pretzel Day Saturday February 20, 2010 10am-3pm. You can stop by any Auntie Anne’s and get one free original or cinnamon pretzel per peron.